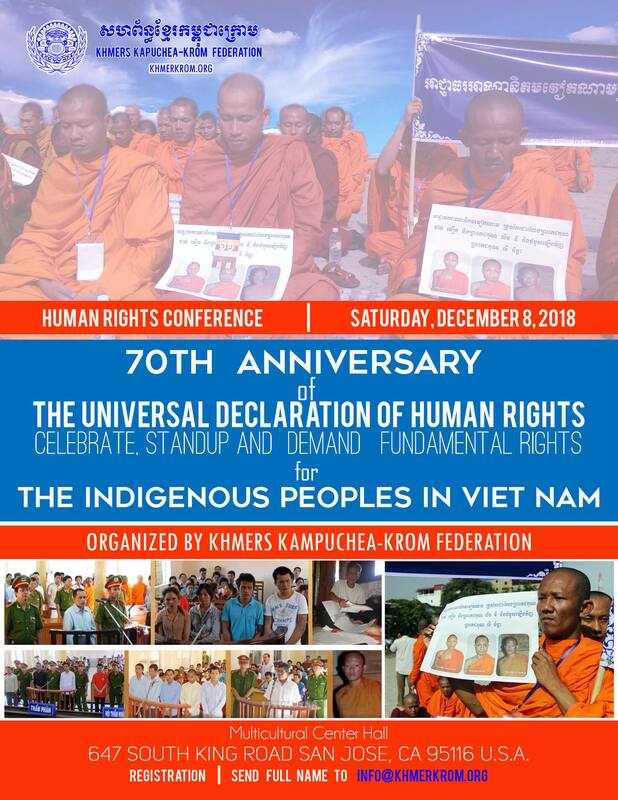 The Khmers Kampuchea-Krom Federation (KKF) will host a one-day human rights conference entitled “70th Anniversary of the Universal Declaration of Human Rights: Celebrate, Standup and Demand Fundamental Rights for the Indigenous Peoples in Viet Nam” in San Jose, California, on Saturday, December 8, 2018, from 9 am to 4 pm, to celebrate the 70th Anniversary of the UDHR and continue raising the awareness of the current human rights violations against the Khmer-Krom who are the indigenous peoples of the Mekong Delta. Every year on the tenth of December, people around the world celebrate the Human Rights Day which is the day the United Nations General Assembly adopted the Universal Declaration of Human Rights (UDHR) in 1948. Unfortunately, the indigenous peoples in Viet Nam have not yet enjoyed the fundamental rights as enshrined in the UDHR, especially the right to freely celebrate the Human Rights Day. As a member state, Viet Nam signed seven out of nine treaties with the United Nations and also signed to adopt the United Nations Declaration on the Rights of Indigenous Peoples (UN DRIP). Ironically, the Vietnamese government refuses to recognize the indigenous peoples in Viet Nam and label them as the ethnic minority. Lacking recognition, the indigenous peoples in Viet Nam have been facing human rights violations and assimilation that have raised serious concerns. The human rights advocates, elected officials, scholars, and members of the civil society will be invited to speak at this conference to “promote, engage and reflect” on the UDHR, and also focus on discussing how to leverage the international human rights system to protect and promote the fundamental rights of the indigenous peoples in Viet Nam.